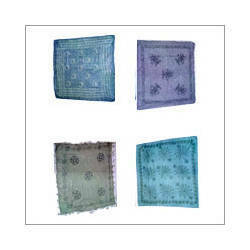 Exporter of a wide range of products which include batik print scarves. We are one of the accredited manufacturers, suppliers and exporters of a premium range of Batik Print Scarves. Designed using finest quality fabric, our range is available in variegated shades. These products exhibit the attitude and personality of the wearer because of its sober and trendy look. Furthermore, we customize these as per the specifications detailed by clients. Looking for Batik Print Scarves ?